Neil Gaiman’s advice to the University of the Arts graduating class of 2012 was simple: the old rules are crumbling, nobody knows what the new rules are, so make up your own. His voice is gentle, and he speaks from experience—he’s made up a pretty interesting life for himself. His quiet coaching goes down as smooth as one of his all-ages books. 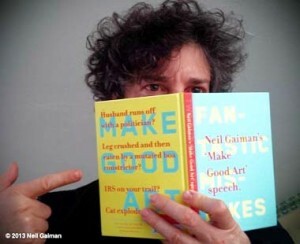 In fact, working with designer Chipp Kid, he turned the speech into a book: Fantastic Mistakes: Neil Gaiman’s “Make Good Art” Speech. It’s full of eye and brain candy that can be read in snippets or of a piece, silently or aloud. If you don’t know it’s impossible it’s easier to do. People who know what they are doing know the rules, and know what is possible and impossible. You do not. And you should not. The rules on what is possible and impossible in the arts were made by people who had not tested the bounds of the possible by going beyond them. And you can. There are stories of mine that have never been re-printed. Some of them never even left the house. But I learned as much from them as the things that worked. Fantastic Mistakes. Neil Gaiman’s “Make Good Art” Speech.